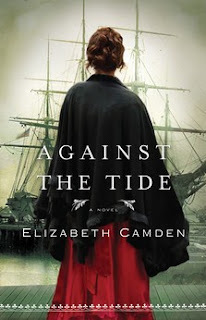 Against the Tide by Elizabeth Camden quickly draws you into its story of a young girl orphaned, abandoned, maltreated but still manages to hold her own in the busy town of Boston. Though described as quirks, Lydia's insecurities are justifiably tangible, and her strong character is easily likable. What's not to love about a young lady who can interpret many languages? It was a man's world in the US Navy circa 1891, but Lydia's strengths cannot be overlooked during crucial times of naval development. Her boss, Admiral Fontaine, has women keening for him left and right and luckily for Lydia he is willing to vouch for her. (I can see Darcy material in him). But even he is not perfect, and that's where Bane steps in. With the Adonis as his moniker, he sweeps Lydia off her feet as she throws caution to the wind to help Bane's attempts at thwarting a vicious opium dealer known as The Professor. Very ominous tones illuminate this suspenseful plot as we still hope that somehow Lydia can find a knight in shining armor and finally care for her. I loved the plot lines, and the faith questions as they meandered through the intense journey of love, hope, betrayal and vindication. I can only imagine that I would have enjoyed the story even more (hardly possible) if I had the time to read the previous book by Elizabeth Camden (The Lady of Bolton Hill) which also included Bane, but it is certainly going on my to be read pile! Edited to add that Against The Tide was a 2013 Christy Award WINNER in the Historical Romance category! Congrats!